Kamala beach lies on Phuket’s stunning west coast, just north of the party town of Patong and the next beach south from Surin beach. Kamala used to have a reputation as a quieter stretch of Phuket beaches, but over the past year, it has started to change into somewhere to be and somewhere to be seen. 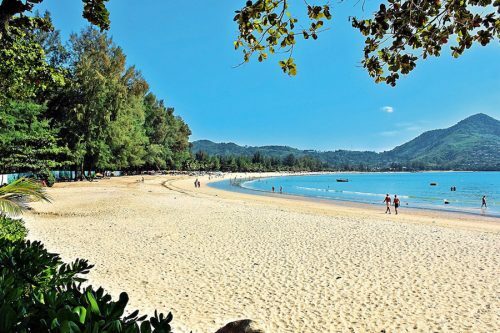 The southern end of Kamala beach use to be the busiest part for many years due to a few hotels with direct access, however, with the opening f the Novotel Kamala beach, HQ beach lounge and now the very popular Café Del Mar, the northern end is now the busiest part. Sitting perfectly on Kamala beach and graced with Phuket’s best sunset, you can relax at Cafe Del Mar with complimenting tones of ocean blues and sandy hues, at Phuket’s coolest beach club. There is an array of restaurants and food stalls to cater for any tastes and any budget. Café Del Mar and HQ lounge offer great menus and great drinks, whereas the small food carts on the beach road at the southern end offer you a real experience of Thai street food. 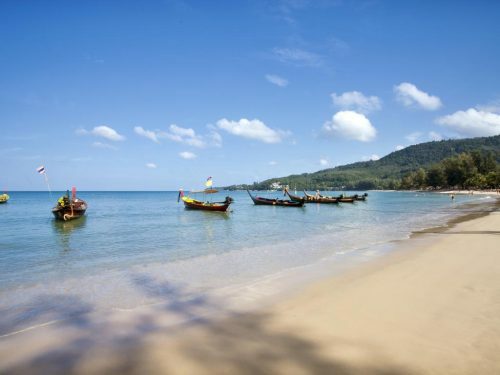 Kamala beach is a perfect escape for those travels and locals seeking a real island experience. Kamala’s long beach, at just over 2.5km of soft sand, has been a favorite with locals, expats, and visitors for many years, due to its clear waters and stunning sunsets. Kamala beach is also one of the only beaches in Phuket to offer good surfing conditions from April to November. Surfboards and body boards can be hired from the guys on the beach, but please note that the sea conditions during April and November can be difficult for swimming as there are rip tides. If it’s a day of quiet relaxation or hanging out with friends drinking cocktails and dancing to the coolest DJ’s or trying some new watersports, then Kamala beach is waiting for you. Its only 10 minutes to Patong or 30 minutes to Phuket Town.